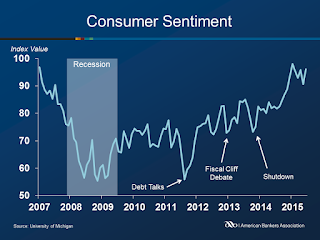 Consumer sentiment rose to 96.1 in June, up 5.4 points from the previous month according to the University of Michigan Consumer Sentiment Index. The index is currently 15.6 points higher than in June of 2014. The Current Economic Conditions index rose 8.1 points to 108.9, while the Index of Consumer Expectations rose 3.6 points to 87.8.